The overall goal of this project is to advance the field of East Asian religions by identifying, systematically studying, and disseminating significant textual and visual sources preserved in China, Japan, Korea, and Vietnam. To achieve this end, we will bring together an international team of research partners and students for on-site investigation, workshops, and conferences over a seven-year period. Our international team will survey key sites of religious practice and strategic nodes in the dissemination and preservation of religious knowledge in East Asia. While taking stock of ongoing ethnological and sociological research concerning living religions in several East Asian societies, our focus is on the long-term production and transmission of religious knowledge, based on the pivotal observation that many ancient texts written in Chinese characters (in various languages) continue to be studied and utilized today. Our principal aim is to create a forum for indisputably collaborative and interdisciplinary analysis of textual and visual sources, non-canonical and canonical alike, which were not only integral to pre-modern religious people across East Asia but also continue to be read and put into practice by present-day Chinese, Japanese, Korean, and Vietnamese communities within East Asia and overseas. Accessing, recording, and interpreting this material requires a worldwide network of institutions and scholars, each contributing different skills and resources, with a robust infrastructure for online storage and dissemination of the results of our research. The insights we produce and publish based on the project promise to fundamentally change what we know about East Asian religions and how we know it, from the ground up. 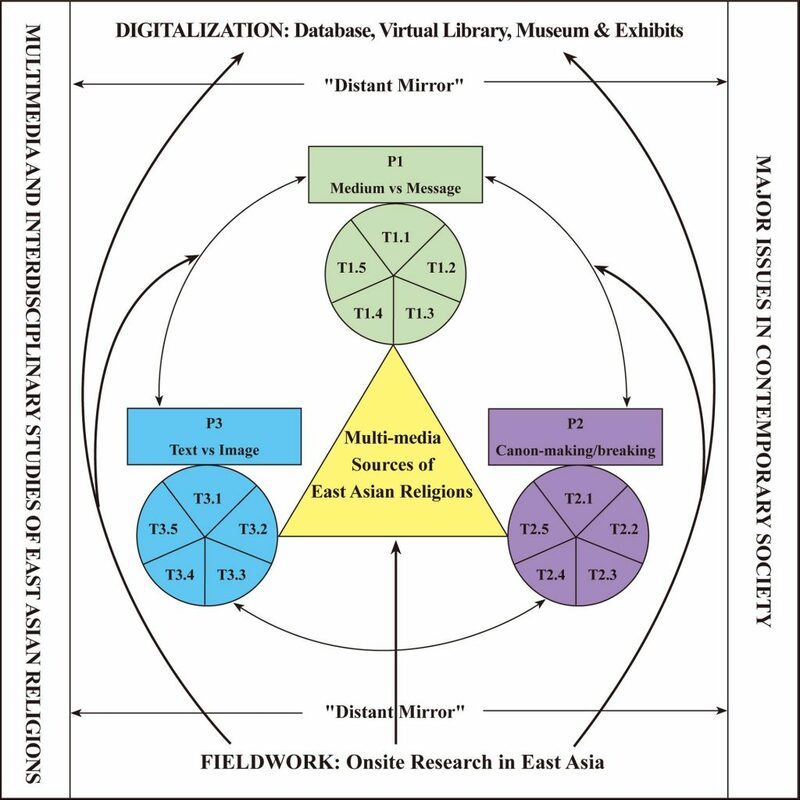 Linkages between technological innovations—particularly communicative technologies—and religious practices and beliefs. Issues of constructing borders and crossing boundaries run through each of the three program areas. Canon formation, for instance, establishes, maintains, and challenges lines between authoritative or authentic articles and their unrecognized counterparts. Technologies such as printing cut through barriers for local communities of practitioners by giving people in apparently remote places and times access to religious knowledge in a convenient and affordable medium. And classifying articles in terms of either texts or images determines, at least in part, the ways we analyze their impact. Each of these three research programs is supported by five clusters (in total of 15 clusters).